Delighted to hear that Sam Jackson, piano-player extraordinaire and good friend of us here at Booming Back, is releasing his first solo album Sharp & Flat today. I had the opportunity to hear him preview some of the tracks at a series in the National Concert Hall last year and they were brilliant, I was particularly impressed with An Ending of Sorts where he looped (live!) a vintage Fender Rhodes and then turned around to continue playing the rest of the song on a grand piano, just amazing to watch and hear, though the uptempo Smoke and altogether more dreamy, lazy Sunday afternoon sounds of The Gramophone vie with it for my favourite track on the album. Sam will be touring soon with nights in the Castalia Hall, Callan (21st September), the National Concert Hall, Dublin (1st October), The Model, Sligo (5th October) and finally in Druid Lane Theatre, Galway (10th October). The Castalia Hall concert is free and part of Culture night, and should be a real treat in a unique venue, and I'll be along to the National Concert Hall myself. More details about the tour can be found on Sam's website. 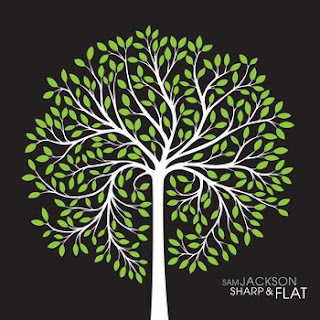 You can listen to a preview of Sharp & Flat below, and while it is available digitally on iTunes you really should pick up the CD which has a simply stunning cover illustrated by Paula McGloin. The CD is on sale in Tower and in independent music shops around the country and on sale at Bandcamp where you can get a digital copy immediately and a Really-Real world physical CD will be posted out to you as well. The nice, smooth, nice sounds of Jazz are definitely not my normal cup of tea, but Sam's piano compositions are something else entirely. Thanks Boomingback! See you the at National Concert Hall. My god. This is breathtakingly beautiful. I will be massively plugging the bejaysis out of this album on my monthly jazz show in New Zealand. @Sammy J - Thank you sir, for such an amazing album. @Sir Rhino - I thought this would most definitely be your cup of tea, and here's a little bit of local colour for your listeners, some of the tunes were composed originally in Wanaka, and recorded in NZ with Reece McNaughten (part of Wellington's Family Cactus).